How do you identify your core customers? So you’re set on your business idea and you’ve got a business plan, how do you start identifying your main group of customers? We have developed a set of questions that you can use to learn more about your customers and to narrow down the target segment that you want to spend the most time and energy with. Once you have the answers to these questions, you can use this information to create a product or service that best fulfills your customers’ needs. For Example: Skysthelimit.org’s customers, our entrepreneurs, face many obstacles we aim to solve for as an organization. That’s why we provide a template for a business plan! That’s why we provide the Friends & Family Fund grants and other financial planning resources. That’s why we match entrepreneurs with experienced advisers who can act as a trustworthy sounding board, and we provide a community of other entrepreneurs. 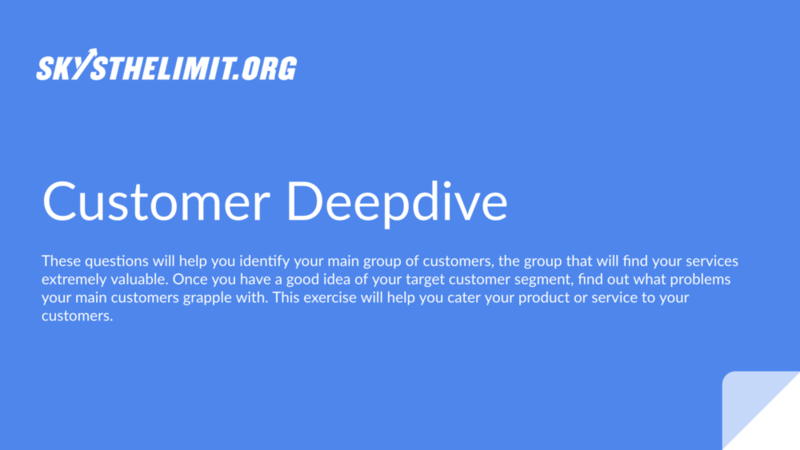 Use this tool to help you understand your customers. You can either print the slides or make your own online copy to reference later on.